If you use Google Calendar to keep track of your appointments, you can send yourself SMS reminders of the events you have listed. Once you've signed up with Google and logged in, you can add your upcoming activities to your online calendar, too. Receive alerts via cell phone of upcoming events on your Google Calendar. To set alerts for the events, click Settings at the top right of the page, choose Notifications, scroll to the bottom of the page, and enter your country, phone number, and cell provider. Google will then text you a verification code to enter on this page. After you enter the code, check the boxes for event reminders at the top of the page. 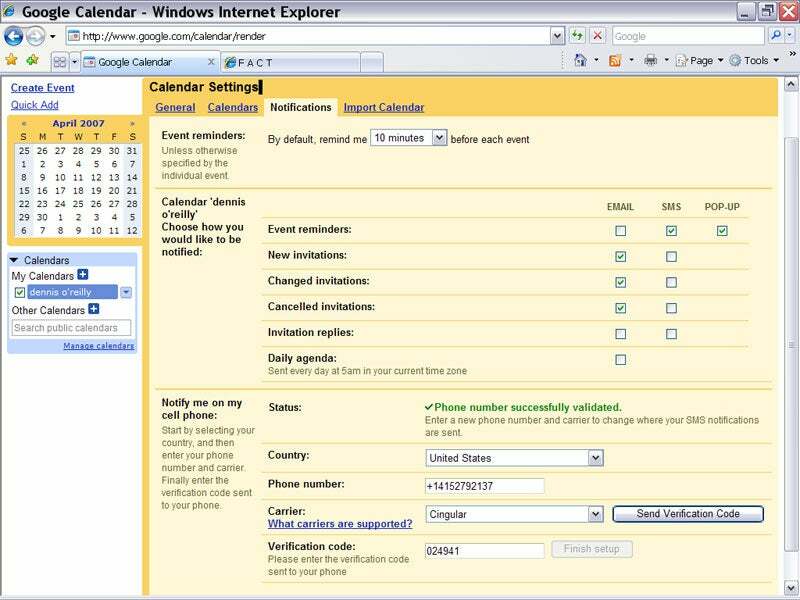 Once you have events in your Google Calendar, the service will send you a text-message reminder for each upcoming event. Alternatively, you can ask to be sent a daily agenda, which includes all of that day's events. Anyone who makes a lot of international calls can use SMS to take advantage of cheaper rates. Two of my favorite SMS services are Call2.com and U.K. ISP Telecomplete's MyWebCalls.com. Both allow you to send an SMS message to their servers, which then either place the call (if you have previously registered the number you're calling) or call you back with a dial-tone allowing you to enter the number manually. Call2.com uses standard phone lines, while MyWebCalls.com is VoIP-based, which is cheaper but may be less reliable. Calling France on MyWebCalls.com is 1.4 cents per minute, while on Call2.com it's nearly 6 cents per minute. After you register for the service, you text the number that the service assigns you (you may also need to enter a password). You could use this service to place domestic calls as well, but the real savings come when placing calls from outside the United States. Read our reviews of three other VoIP-based services for cell phones.